The next in our graduate success stories reaches the furthest back into the School of Music and Performing Arts’ past to date, from 2004 graduate Andee Price who kindly agreed to an interview regarding her time at Christ Church. Andee studied on the Canterbury Campus on what was then a BA Music course before it became the more familiar BMus in her second year. 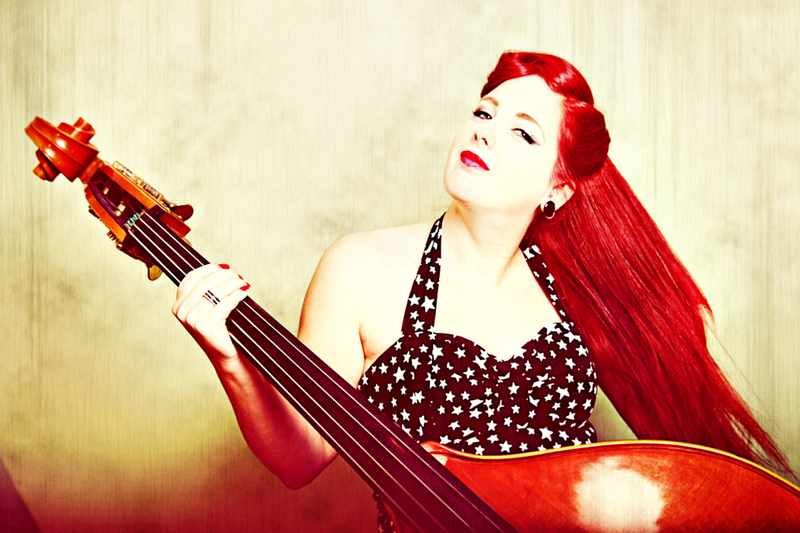 She began her study as a classical guitarist, but swapped to bass guitar in her final year, which had always been her intention as it was then her aspiration to become a session musician. She recalls that she was lucky to have an incredible guitar teacher throughout her study, who taught her to play ‘the appropriate thing for the gig you are in’ and instilled a good work ethic. Furthermore, ensuring Andee had all the necessary skills to become a musician with a lot of emphasis on the ability to sight read and decipher chord charts. Andee studied at a time when both classical and commercial musicians worked in Canterbury together – something that will soon return when the Broadstairs Campus join us in the New Arts Building in 2018. This mixed background of musicians meant she could gain classical experience in the orchestra, chamber group and classical guitar ensemble, but also perform with the big band and the fusion ensemble. With this experience, she excelled at university, receiving an Upper Second Class Honours and a prize for her outstanding improvisational work at graduation. 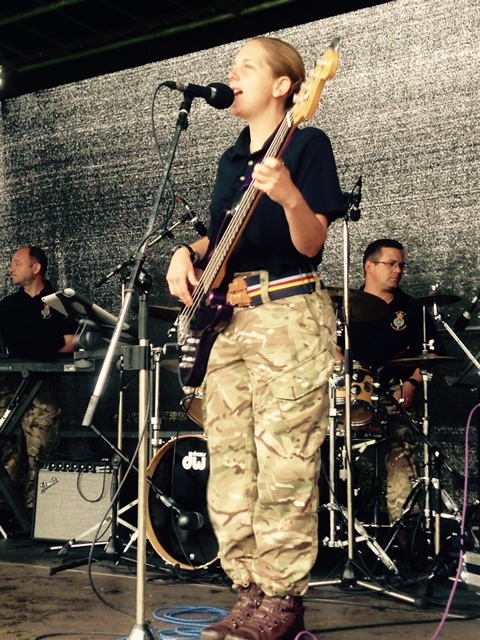 Although Andee achieved her goal of playing as a sessional musician, in pop acts, function bands, jazz gigs, on cruise ships and in theatre productions as well as recording her own music and that of others, she ultimately decided to take a dramatic career change which led her into the Corps of Army Music. I freelanced as a bass player for 10 years before applying to join the Corps of Army Music in 2014. I completed basic training and musical training and was posted to the Band of the Queen’s Division in May of this year (2016). The band are a multi-capability band, which means we are very versatile. Employed on engagements to perform traditional military marching displays but also wind band concerts, big band, function band and an array of smaller ensembles. Therefore, I am utilized as a tuba player, bass guitarist, string bass player, guitarist and singer. I applied to join CAMUS around the time they were recruiting contemporary musicians in an attempt to move with the times. I was attracted to the job because of the salary, but I am really enjoying the variety of jobs and the scope for progression. In April 2014 I was coming to the end of a nine-month theatre tour of the show 7 Brides for 7 Brothers. I was playing bass in the house band for a jam night on a day off and I met a young saxophonist who was in the Marines. He was home on leave. He raved about the job saying how good it was and I told him I had considered joining when I was younger. He said I still could now so I looked into it. I had been considering a complete career change at that time as, although freelancing was always varied and fun, it could be very unstable in terms of income and work had been slow for a few years. I did well at freelancing, but the need for steady work became apparent. In some ways I wish I’d joined the forces sooner, but arriving in this position this way around meant that I came into the job with a lot of valuable experience, which can be utilized within the Corps. This is especially the case as a graduate – I needed that experience. There is also a clear career progression for me within the Corps that you don’t have in freelancing. I would recommend joining the Corps of Army Music to anyone who would like to play music professionally. The performance opportunities are amazing and the travel as well. I would advise anyone to go to a recruiting event and get a feel for the job and to audition. Christ Church gave me a very broad and well-rounded musical experience. Due to my course, I was fully equipped for the varied skillset required for a multi-capability band like the Band of the Queen’s Division. Having studied music, I was able to complete the musical training at the Royal Military School of Music. The team at the School of Music and Performing Arts were fabulous when I was there. Very inspiring and very encouraging especially of those students like myself, who maybe did not have the traditional musical training and qualifications. However, more importantly and significant for me was the quality of the one to one instrumental tutors and training on offer. They were incredible. Also, Canterbury is a lovely city to study in, there were lots of opportunities to perform both as part of the course and in the community in general. Has this graduate story inspired you to study with us at Christ Church? Read about the BMus Music programme on which Andee studied and how to apply on our website here.